The Porta is a portable solar lighting system used for temporary parking lots, construction sites, outdoor/seasonal concert/fair venues, temporary roadways, and leased property. The Porta system comes in 20W, 30W and 40W, 20′ pole with both single and dual fixtures. The Porta is also Dark Sky Friendly. Greenshine has developed the industry’s first and only above ground Portable Solar Light! The Porta series is perfect for temporary lighting projects (typically lasting 2-4 years) where digging and pouring concrete foundations is not ideal. The Porta provides mobility for the projects that require it. Greenshine’s engineers have designed a proprietary above ground concrete pedestal base for both single and dual light poles, which can be moved around with a forklift. Applications include temporary lighting for parking lots, construction sites, outdoor/seasonal concert/fair venues, temporary roadways, leased property and anywhere digging/pouring an underground concrete foundation is not optimal. The Porta comes in 20W, 30W and 40W, 20′ pole with both single and dual fixtures. 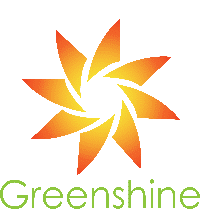 Greenshine can provide a full turnkey solar lighting solution, including delivery of pre-fabbed, portable concrete bases for your project. GS-LED-260 – an architecturally pleasing LED light fixture with a round form and dome-shaped top.